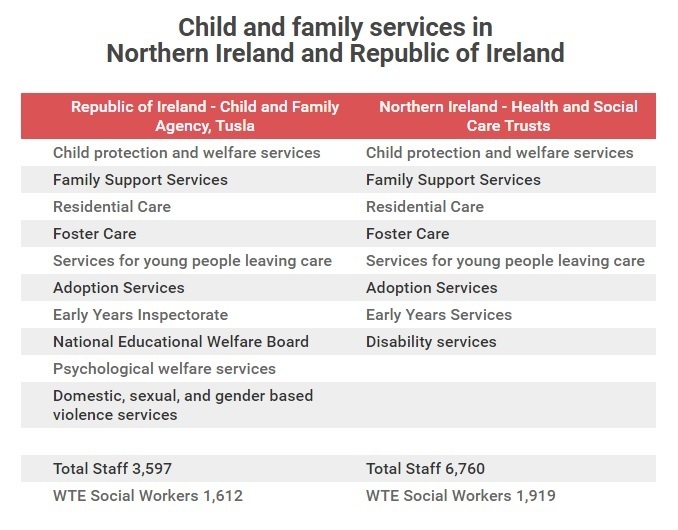 THERE are three times more social workers per head of population employed in child and family services in Northern Ireland than in the Republic of Ireland, The Detail can reveal. As part of an investigation into child protection, The Detail has identified a significant difference in the number of social workers employed in child and family services in both jurisdictions. In the north child and family services are provided by 6,760 staff across five Health and Social Care Trusts and overseen by the Health and Social Care Board. In the south 3,597 staff are directly employed by the child and family agency, Tusla, across 17 services areas. A number of voluntary and community organisations also support the work of child and family services in the south. Child and family services operate slightly differently north and south, as illustrated in the table below. For example child and family services in the north provide disability services while Tusla in the south provides additional services under the National Educational Welfare Board. As the focus of this investigation was child protection we set out to examine frontline staffing levels - the numbers of social workers employed in child and family services. In the absence of figures for social workers specifically engaged in child protection we sought details of the overall number of social work staff employed in child and family services in both jurisdictions. In the north, there were 1,919 social workers (whole time equivalent) employed in child and family care services, according to a workforce census carried out in March 2016 by the Health and Social Care Board. In the south, the child and family agency, Tusla, confirmed that 1,612 social workers were employed across the service in August 2016. The figure includes 1,485 whole time equivalent staff and 127 agency staff across Tusla services. When population is taken into account the difference in staffing resources north and south is even greater. The total population in the Republic of Ireland stood at 4,757,976 in 2016, according to the most recent Census figures. The Northern Ireland Statistics and Research Agency put the total population of Northern Ireland at 1,851,600 in mid-2015. This means there is one social worker per 1,000 population in Northern Ireland working in the area of child and family services compared to one social worker per 3,000 population in the south.